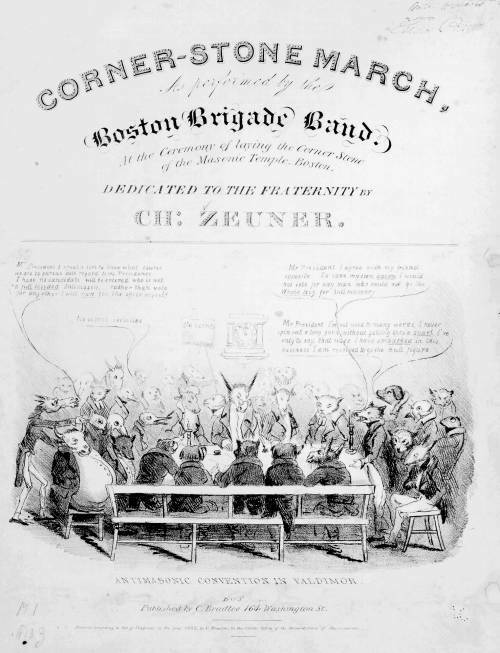 An illustrated sheet music cover for a march dedicated to the Masons. According to the text the march was performed "at the Ceremony of laying the Corner Stone of the Masonic Temple, Boston." The illustration parodies the national convention of the Antimasonic party, held in September 1831 in Baltimore ("Valdimor"). The convention nominated William Wirt for President and Amos Ellmaker for Vice President. The attendees are pictured as asses, geese, goats, and other animals gathered at a table presided over by a donkey wearing spectacles (center). A horse at left says, "Mr. President I should like to know what course we are to pursue with regard to the Presidency. I hope no candidate will be entered who is not a "full blooded" Antimason. rather than vote for any other I will "run" for the office myself." A cat in the background says, "No secret societies." A pig at right: "...I agree with my friend opposite. To save my own "Bacon" I would not vote for any man who would not go the "Whole Hog" for Antimasonry. A dog: "...I'm not used to many words. I never spin out a long yarn without getting into a "snarl." I've only to say, that since I have em"barked" in this business I am resolved to go the hull figure." On the wall in the background a clock reads five minutes to midnight. The print appears to have been drawn by David Claypool Johnston. Malcolm Johnson records a sketch for the illustration in the collection of the American Antiquarian Society. D. C. Johnston's "Much Ado about Nothing" (see 1832-3), published in Boston slightly later, is akin in style, lettering, and in the nature of the scene. Both prints include the motif of a clock on the background wall.